Acupuncture Research in the News — Amy Chitwood Burslem, LAc. 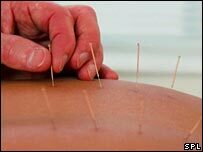 In light of my series about what acupuncture can treat, please check out these acupuncture articles making the news! CNN, the Canadian Broadcasting Corporation (the CBC), and the BBC all showed results of a low back pain clinical trial. Although I have my own feelings about sham acupuncture and the way we have to use it, I'm excited to see the research making mainstream news. I work in the research department at the Oregon College of Oriental Medicine, and seeing these articles in the news proves to me that Traditional Chinese Medicine is making headway within our culture and all around the world. Read on!